Twenty years ago Windows 98 became available for sale to the general public, yet the operating system enjoyed a mixed reputation. It brought new features and refined the concept of PNP (Plug & Play) devices which could automatically be detected by the system when connected to a USB port. However, Windows 98 was also famous for being the OS which displayed the BSOD (Blue Screen of Death): fatal errors which often resulted in users having to restart their system and lose any unsaved work. Yet the platform also supported some of the top games of the late 90’s, such as Tomb Raider II. If you’re feeling nostalgic, in this guide you’ll learn how to relive your glory days on Windows 98. Some of the steps we suggest are only skin deep, such as installing a ‘classic’ theme in Windows 10 or Ubuntu Linux. Others will allow you to actually run programs designed for Windows 98 using a virtual machine or an emulator. Previous versions of Windows such as Windows 7 offered a ‘Classic’ theme for your desktop. This consisted of a more traditional grey Start menu, a vintage icon set and more basic graphics. However, Microsoft have not developed a Classic theme for Windows 10. But, thanks to the efforts of programmer ‘kizo’ there is a third party add on which achieves much the same effect. To get started visit the Deviant Art website and click ‘Download’ on the right hand side of the screen. The theme file will download automatically. Once the theme file has downloaded, open File Explorer and navigate to the Downloads folder. Locate the file named windows_classic_theme_for_windows.zip and double-click to extract its contents. The theme file (Windows Theme) will appear automatically in the same folder as the Zip file. Right click the theme file and choose ‘Copy’. Next, click the address bar at the top of the File Explorer window and enter ‘C:\Windows\Resources\Ease of Access Themes folder’. Right-click anywhere inside the folder window and choose ‘Paste’. A tick box named ‘classic’ will now appear automatically on the left-hand side of the window. Left click on this once to activate the ‘classic’ theme. Once the classic theme is loaded, you’ll notice that the Desktop background is a rather insipid shade of green which was used in early versions of Windows 98. For users of Windows 98 SE (Second Edition), this may not be too familiar. Fortunately there are plenty of good quality desktop backgrounds available online which imitate the Windows 98 desktop. To customize the desktop further, first find your chosen image such as this one from www.getwallpapers.com. Next, right-click the image and choose ‘Save Image As’ to download it to an easy to remember location (such as your ‘Pictures’ folder). Once the download is complete, open the Windows 10 File Explorer and navigate to the location of the image. Double-click to open the image in the Photos app. Finally, right-click on the image choose ‘Set as Desktop’. 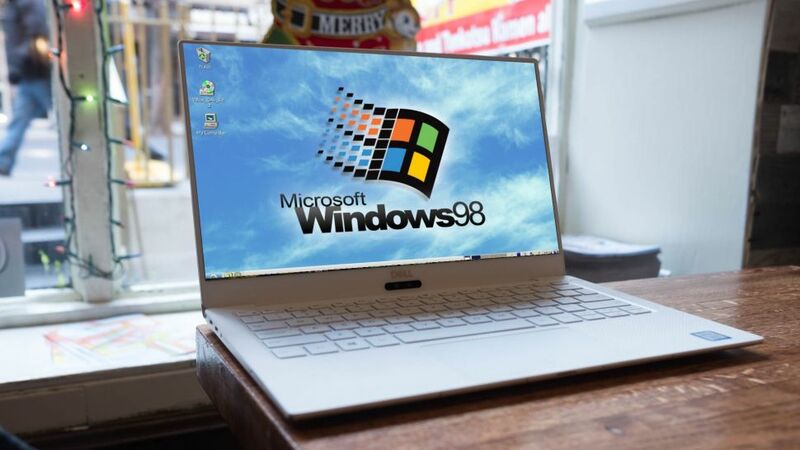 The desktop background will now be changed to the Windows 98 image that you downloaded. As nostalgic as the classic theme appears, it may not work well with more modern features. For instance, when using the Microsoft Edge browser, the grey look and feel can make individual buttons hard to distinguish. To deactivate the classic theme, go to the Windows menu and type in ‘Themes’. Click on ‘Themes and related settings’. From here you can choose a theme more suited for you such as ‘Windows 10’ theme. To revert your desktop background, right click anywhere on your desktop and choose ‘Personalize’. The ‘Background’ option should appear automatically. From here you can choose a Windows 10-inspired background. While it’s relatively easy to make your Windows 10 desktop resemble Windows 98, this won’t change your default system applications or allow you to run certain classic Windows programs. However, you can do this by running Windows 98 as a ‘virtual’ machine. Virtual machines are designed to mimic a computer as closely as possible while running inside your operating system. You can manage them via a VM Manager application such as VirtualBox. The downside to using VM’s is that they can only use a portion of your PC’s resources but as Windows 98 only requires 24MB of RAM this won’t be an issue. To begin, visit the VirtualBox website and click the link to download. This will take you to the downloads page. Choose the latest version of VirtualBox suitable for your platform e.g. Windows host. Once download is complete double click to launch the installer. Once the installer launches, click ‘Next’ to begin. Click ‘Next’ again to install default features. To complete installation, VirtualBox will disconnect your machine briefly from the internet. Save any open files and close your browser before proceeding. Windows 10 may ask you to confirm software installation. Once installation is complete click ‘Finish’ and VirtualBox will launch automatically. Click ‘New’ at the top left hand corner of the window to start creating your virtual machine. Select the ‘Name’ field and type ‘Windows 98 SE’. VirtualBox will automatically choose the correct OS type for you. Click ‘Next’ to proceed. Click ‘Next’ to accept the suggested RAM allocation (64MB). Do the same in the ‘Hard Disk’ section to create a virtual 2GB hard drive. Click ‘Create’ to confirm your VM settings. VirtualBox will now prompt you to choose a Hard Disk type. Select ‘Next’ to choose the default configuration. Click ‘Create’ to finalize your virtual hard disk settings. Although you have now created a virtual machine capable of running Windows 98, its virtual hard drive is currently blank. To install Windows 98 you need either an original CD from Microsoft (these are still available from websites like eBay) or a valid ISO file of the same. We recommend using Windows 98 SE, as this version of the OS is designed to be bootable. Once you’ve obtained one of these, re-launch virtual box and select your Windows 98 VM on the left hand side. Click the ‘Settings’ icon at the top of the window. Select the ‘Storage’ tab. Under ‘Attributes’ on the right hand side, select the CD icon and ‘Choose Virtual Optical Disk File’. From here you can navigate to the ISO file for Windows 98. Click ‘OK’ to confirm. Click ‘Start’ from the main VirtualBox window to activate your virtual machine. The VM will ask you to boot from hard disk or CD-ROM. Press 2 to choose CD ROM. Press return to launch Windows 98 setup. Once the Windows 98 setup launches, press ‘Enter’ to begin installation. Press ‘Enter’ once again to have Windows 98 partition your virtual hard drive for you. Use the ‘Down’ key to choose to use ‘large disk support’ and then press ‘Enter’ again to continue. Press ‘Enter’ once again to restart your VM. Once the VM reboots choose to start from a CD. Next, choose option 1 to enter the ‘Setup’ process. You will then see a screen showing the Hard Disk being formatted. Once this is completed, you need to press ‘Enter’ in order to initialize a routine system check. After the system check is complete, a Windows 98 Setup Box will appear. From here you can start the process, which can take between 30 to 60 minutes. Click ‘Continue’. The Windows 98 Setup Wizard will now launch. Windows 98 Setup will now ask you to enter your name and a company name as applicable. Click ‘Next’ when you are done. Choose ‘I accept the agreement’ then click ‘Next’ to proceed. Setup will now ask for a product key. You can find this on the packaging that came with your Windows 98 CD. Product keys are 25 digits long, arranged in groups of 5 e.g. 12345-12345-12345-12345-12345. Click ‘Finish’ to complete setup. Windows 98 is not only for modern Microsoft users. Many people who use the free and open source Linux operating system also remember classic versions of Windows fondly. While Linux cannot natively run programs designed for Windows, the OS is designed to be highly customizable. This includes installing ‘Themes’ which transform the overall look and feel of your desktop. One Linux user, Nikola Obradović, has combined his love of windows and Linux by creating a program which would transform your GUI to resemble Windows 98. This application works best in Lubuntu, a variation of Ubuntu Linux. To get started, download the setup files from Nikola’s Dropbox. Open your Downloads folders and double-click on the ‘Windows95Box64.tar.gz’ file and choose ‘Extract here’. Once extraction is complete, open the folder called ‘Windows95Box64.tar.gz’. From here right-click on the ‘Install sh’ file and choose ‘Properties’. Select the ‘Permissions’ tab. Ensure ‘Execute’ is set to ‘Anyone’. Once you have done this, choose ‘OK’. Next, double-click on ‘Install she’ to run set up. Select ‘Execute in terminal’. If you have a password set it will ask you to enter this now. Do so and press return. Installation will now begin. Your Linux machine will need to restart in order to apply your new settings. Please make sure to save and close any open files before you do so. Once you have logged back in, you can access regular Linux menu options via the ‘Start’ menu. While Lubuntu may superficially resemble Windows 98, it cannot run Windows programs by default. You can work around this issue and enjoy classic Windows apps through using the Wine program. Once installed, Wine will automatically associate itself with Windows programs e.g. files with the file extension ‘.exe’. This means, in theory at least, all you have to do is double-click a program to launch it. As with most Microsoft programs, there are exceptions to this rule as many rely on proprietary graphic software or other external applications. Luckily, the wine HQ website maintains a database of compatible programs. For those which are not fully compatible, the database lists which features are and are not supported. If Wine requires extra software such as ‘wine-mono’, which is necessary for .NET applications, it will prompt you to download this when you first attempt to run a Windows executable file. Many popular Windows programs and games from the late 90’s simply don’t work out of the box in Windows 10. DOSBox is an emulator designed to mimic Intel x86 PC’s. While its primary focus is MS-DOS applications it can also run a number of titles you may remember using in Windows 98 such as Command and Conquer: Red Alert. To begin using DOSBox, select the ‘Downloads’ tab on the website and click the green download button. Once the download is complete, open your downloads folder and double click to launch the DOSBox installer. Click ‘Yes’ to allow Windows 10 to begin installation. Click ‘Next’ to continue, then do the same when DOSBox asks you to choose which components to install. Click the ‘Install’ button to finalize installation. A short cut to DOSBox will now appear on your desktop. DOSBox contains its own crude version of the MS-DOS command prompt. This may be intimidating to Windows users who are accustomed to a friendly GUI but the commands you need to know are very simple. For security reasons DOSBox cannot access all the files on your hard disk. You must specify a folder for DOSBox to mount as a ‘virtual’ drive. To run a program simply enter the full file name and extension. Certain programs and games can only be installed by CD or DVD. Some classic apps also used to require that the installation CD was inserted during run time to prevent software piracy. Although DOSBox attempts to emulate older PC’s as faithfully as possible, you may need to fine tune your emulation settings. This is done by editing the configuration file DOSBox.conf. From here you can edit all DOSBox configuration settings. In Windows 10 the configuration file is found in your ‘AppData’ folder e.g. C:\Users\Nate\AppData. The configuration file can be modified using any simple text editor. We recommend dragging and dropping it into Microsoft Notepad. Sections are ordered logically and usually contain an explanation of what each option does. These are placed after the ‘#’ symbol e.g. ‘Full screen’ can be set to ‘True’ or ‘False’. The DOSBox wiki contains a comprehensive rundown of all configuration options.